Uggg....Isn't the Housing Market Supposed to be Booming??? Completely removing myself from this situation, the price we have it at right now is bargain basement pricing(less than we paid in 2009)....so, if it doesn't sell....we are obviously not meant to move right now. I am trying to just let go and leave it up to God...because there isn't anything I can do about it....although after we let our realtor go, we switched to a listing service....which means all the marketing and scheduling showings is, in fact, up to me....but it saves us from paying commission to a listing agent. I will keep you posted on how it goes. In theory, this seems like a great way to sell a house these days because my house is still all over the internet, they just contact me if they are interested in seeing it...not the agent. Here? Wanna see it? Wanna buy it? It really is a sort of great house....just not for a homeschooling family with 6 kids. I feel very scatterbrained lately. The house is still for sale. Nobody seems interested. Our realtor wants us to lower our price....again. VBS is over. I am so happy. I really do have a love/hate relationship with it. My kids have a blast. I can tell most of the other kids have a great time too. It is just so exhausting for me....not just because I taught the music and motions to the songs....but dealing with other people's children who don't know or care about my rules....somehow takes the wind out of my sails....if that makes any sense. It is over. It was good. The songs are still stuck in my head. S-girl has officially lost both of her front teeth and she couldn't possibly be any cuter, could she? S-girl and V-girl have finally hit the stages in their lives where they are true friends and do everything together. It is so fun to watch their relationship and their way of communicating with each other grow. I do step in occassionally to give them ideas on how their conversations could have gone better and the other person wouldn't have gotten angry. Let me just say this, V-girl is a bossy little thing. We went to a garage sale at the house we are hoping to buy and the very sweet current owners let us have this costume for free! I have a feeling there will be some wheeling and dealing going on around Halloween as to who actually gets to wear this one. Apparently, one of my children thought this tub of "almost" butter was photo worthy. We found this at a garage sale for Rainman for Father's Day. It had never been used or put together. The sticker price was $179.99. We got it for $40. The kids have had a blast with it. Rainman has used it quite a bit too (although I don't have a picture of him). He is currently trying to get 100 points...in 1 minute, I think. So far the closest he has gotten is 96. V-girl and S-girl are surprisingly good at this too. And A-girl and L-girl have daily battles and have given themselves quite the work out....they are both sporting pulled and overused muscles at the moment. Their battles are pretty fierce and someone usually leaves unhappy. Okay....that is all for now. Pray for our housing deal....it is not looking good for us to get out of here this summer like I wanted to. I am trying to trust in God's timing. I am trying to be a big girl. A mature adult. Someone who looks at the numbers and makes the best decision for my family. But, really, I just want to sit in the corner and pout until I get my way.....and get out of this house. Oh, wait a minute....I am not an aerobics instructor. I am the music leader at Vacation Bible School. I have survived 3 days of VBS and only have 2 to go. I will continue to make a fool of myself...for the sake of the children. I will probably have gained 5 pounds by weeks end....just because it is me we are talking about. I have a review coming up at the end of the week (for a really cool memory game) and then hopefully, I will be back to blogging a little more regularly....as long as I survive aerobics class.....I mean VBS. We got a chance to try some computer programming, using Motherboard Books. L-girl got to design a webpage using their Let's Make a Web Page lessons. This is a short and sweet program that really does guide you through the basics of setting up your own web page. L-girl (age 11) only got frustrated once or twice and was mostly able to do this as an independent project and proudly show off her finished result. 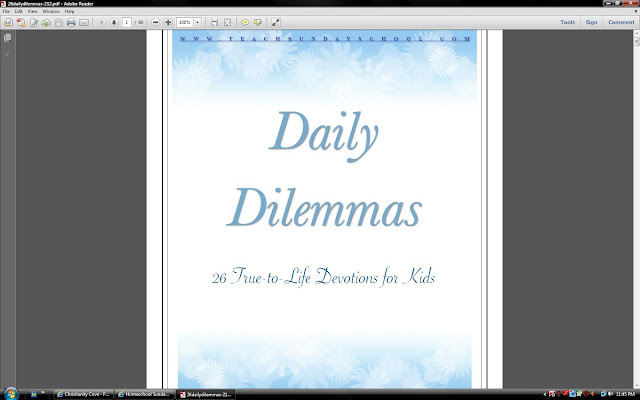 A webpage that she created using a free trial of CoffeeCup HTML software. This program was created by Phyllis Wheeler (a.k.a. The Computer Lady) and designed for teach 8-12 year olds how to successfully create a web page. Her products are definitely geared towards homeschoolers, but would be valuable to anyone who has an interested in knowing more about computers. Let's Make a Web Page consists of a 60 page e-book that goes over things like; how to download and set up the program, adding text and pictures, and how to get your webpage to upload to the internet. This is one ebook that we didn't need to print it off. (Remember, I have a thing about being able to hold my books.) L-girl just had the Let's Make a Web Page ebook open in a tab and would flip back and forth between the two tabs, as she was working. I really liked that the instructions were up front and straight forward about what to do next. They always had pictures too. You know? The "do this and then your screen should look like this"....kind of thing. By following the instructions, L-girl was able to be creative and make this....a website about....me. Like I said, I think there were two times where L-girl came to me and said something like, "It's not working!" But, then I would go sit and she would explain what she had done and how, then we would read through the book together and see where she had gone wrong. Once she got the hang of it, she whizzed right through making her webpage. I will say sometimes the process and detailed stuff left her kind of bored....(I don't think she has a future as a computer programmer). But, I am happy with her end results. She followed through, got to be a little creative and whether she realizes it or not, she took some of the mystery of computers for herself - which will be a great thing as she gets older. Motherboard Books has lots of products designed to take the mystery of computers. Go take a look around and even try out her free internet scavenger hunt! 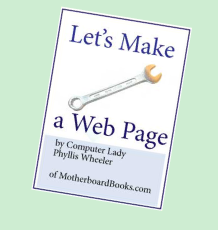 The Let's Make A Web Page program is available for $19.95. The other TOS reviewers got a chance to try this same product or try a more intense program on Logo. Go take a look and see what they thought.